WIN TWO GOLD AWARDS FROM PARENT'S CHOICE! 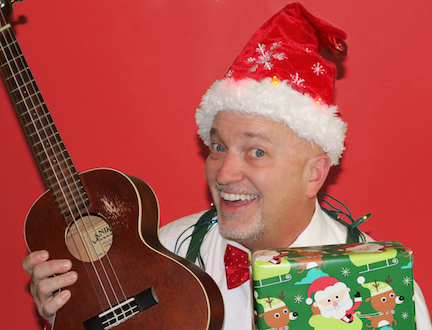 Roger Day writes and performs award-winning children’s music that tickles the imagination with infectious tunes and rhythms and inspiring characters. Day has been writing and performing his smart, interactive music for families for over 15 years and is an approved Dove Family Foundation artist and multiple Parents’ Choice Gold Award winner. Roger Day takes his inspiration from The Beatles, U2 and even The Clash. Day’s recordings for families have included artists such as the Indigo Girls, Nanci Griffith and Buddy Holly’s legendary band, The Crickets. Day has been commissioned to write for organizations including The Savannah Music Festival, The Georgia Sea Grant Foundation, and The Methodist Publishing House. He has performed in venues ranging from Ruth Eckerd Hall to Target Book Festivals to Cynthia Woods Mitchell Pavilion to urban and small town libraries and schools. Roger’s skilled musicianship combines with his wit and wordplay to create a musical experience that parents enjoy as much as their kids. Roger Day's concerts are action-filled adventures that exercise both mind AND muscle; both body AND brain. Day keeps his young audiences involved and captivated. These fun concerts inspire each child to discover his and her own talents, give flight to the imagination: to DREAM BIG! and GET YOUR BRAIN IN GEAR! and now in his newest concert, to be INVINCIBLE! Children’s musician Roger Day, a two-time Parent’s Choice© Gold Award winner, uses his trademark “wit, whimsy and wordplay” – and a fun viral video - to celebrate the unsung heroes that make the zoo a fascinating place for children to learn. The Zookeepers! From veternarians to wildlife bilogists there’s a whole team of people who work together to keep animals at the zoo healthy and safe. Through interactive, energetic songs like “It’s a No No to Kiss a Rhino” and “Rumble in the Jungle” Roger will encourage students to “observe, reflect, question and decide” as they not only learn about the amazing animals at the zoo – what they eat, where they’re from, what’s their habitat – but also the dedicated team of scientists who take care of them everyday. Roger Day can also adapt this show for in-school performances. He has created a powerpoint slide show that will feature highlights of Zookeepers in action and the animals they work with each day. This show is based on a field-trip series Roger Day created in partnership with the Education Depart at the Birmingham Zoo in Birmingham, AL. With advanced planning, he can adapt his set-list for the animals at your particular zoo.